Dalmatian blouse: Alice + Olivia. Calf hair Ballerina flats: Alaia. Dalmatian print chain strap bag: Rebecca Minkoff. 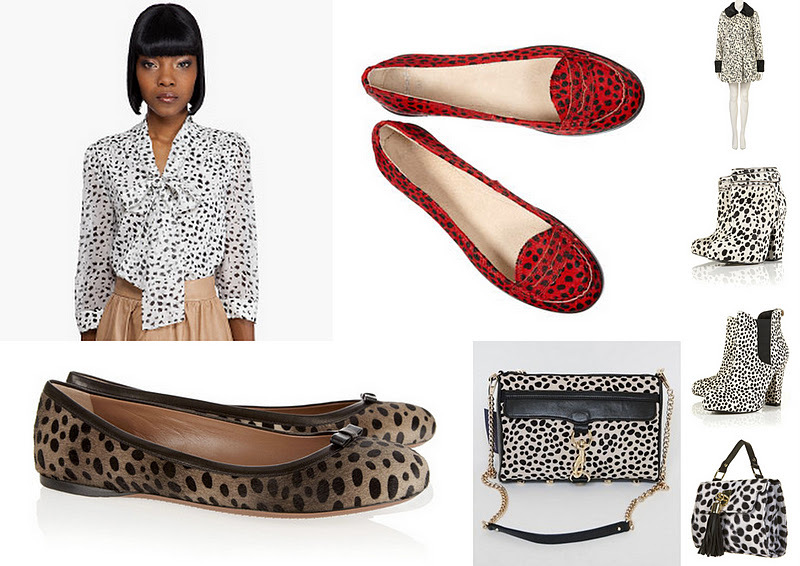 Coat, Bag, Red Dalmatian Flats, Faux fur bag and Boots: TopShop. Dalmatian dots are everywhere at the moment. As a long time lover of leopard print I plan to embrace this trend fully. TopShop has sprinkled dots over almost everything this fall! I could see my 'Revenge' character Ashley Davenport wearing this Alice+Olivia blouse to a party planning session with Victoria.